You have probably heard a few stories over the past few years involving “exploding” vape devices and e-cigarettes. 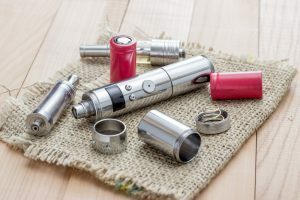 This publicity hasn’t done much for the reputation of the vaping industry, and in fact, in recent years, has caused many to believe that vape pens are unsafe fire hazards. There are very specific circumstances under which a vape pen or e-cigarette can catch fire—these are not random occurrences but rather unfortunate events that occur for known reasons. Two of the most important factors to blame for vape pen and e-cigarette explosions are device quality and device maintenance. An interesting thing to note is that these vape pen “explosions” frequently aren’t caused by the device at all, but result from a chemical reaction which occurs in the device battery. Vape pens work via the battery heating atomizer coils, turning the e-liquid into a vapor, which the user inhales. And these devices are most commonly powered by lithium-ion batteries. While these batteries have undergone a barrage of bad high-profile press (think hoverboards, and the now infamous Samsung Galaxy Note7), they are actually quite safe. K.M. Abraham, a professor and Li-On battery pioneer at Northwestern University, states that, “Lithium-ion batteries have a failure rate that’s less than one in a million.” To compare, the National Oceanic and Atmospheric Administration estimates that an individual’s chances of being struck by lightning at some point in their life is approximately 1-in-13,000. Lithium Ion batteries explode when a breach occurs in a thin barrier called the separator whose job is to keep positively and negatively charged components apart. When the separator is breached and the positive and negative charges combine, it creates a “thermal runaway” process, which leads to fires. Separator breaches can occur in batteries left in pressurized airplane baggage compartments, during exposure to direct sunlight, short circuits, and overcharging. • Power off and take apart the vape device when taking it on a flight. • Always use the original charger that came with your vape device—80% of battery fires have occurred while a device was charging According to the US Fire Administration. • Never leave your vape device to charge overnight! • Do not buy cheap lithium ion batteries. Stick to well-known brands with documented safety reviews. If you think your battery might be overheating, move it away from flammable objects and place on a hard, non-combustible surface. If possible, remove the battery, and let it burn itself out outside. If the battery does catch fire, use a fire extinguisher, water, or non-alcoholic (alcohol is flammable) liquid to prevent the fire from spreading.